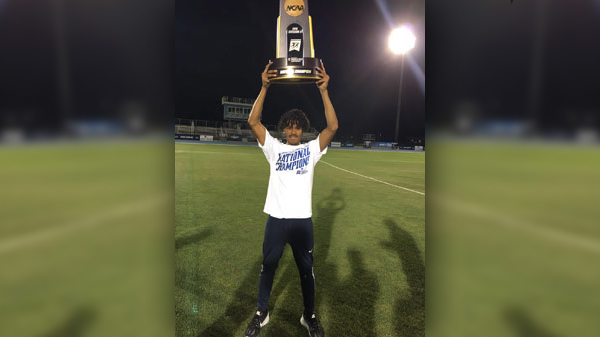 [Updated with video] Bermuda’s Shaquille Dill has claimed an NCAA championship title after winning the 800m final in Bradenton, Florida. BNNA President Donna Raynor said, “After a disappointing NCAA indoor D2 championships Shaquille came back very strong in the NCAA D2 outdoor Championships. “The championships took place in Bradenton, Florida. He won the 800m final and became NCAA champion in a time of 1.49.30. “His 4x400m relay team won in a time of 3.05.47 with Shaquille running a heck of a 2nd leg placing his team in 1st place. His men’s team for St Augustine then went on to win the overall championship with 85 points and second place 36. What a great way to end off their university season. “Shaquille is also trying to reach the qualifying standard in the 800 needing to run 1.46. Hopefully the XL Catlin National Championships will get good press early, so that more folk can turn out. Congratulations to Shaquille.